Since we bought the lake property back in mid-2014, I’ve come across a number of animal carcasses. But until a few days ago, I’ve never actually witnessed a kill. It was just after first light and we spotted the coyote close to the shoreline. Just a little farther out was a deer, standing on the ice. I immediately knew this was going to be a life-or-death battle, as deer cannot walk on ice. They slip and slide and fall. Sure enough, the coyote started running after the deer, and the deer actually made some good headway. I thought it might make the island. But then it fell a number of times and the coyote caught up to it. Fortunately, the kill was swift, all things considered. 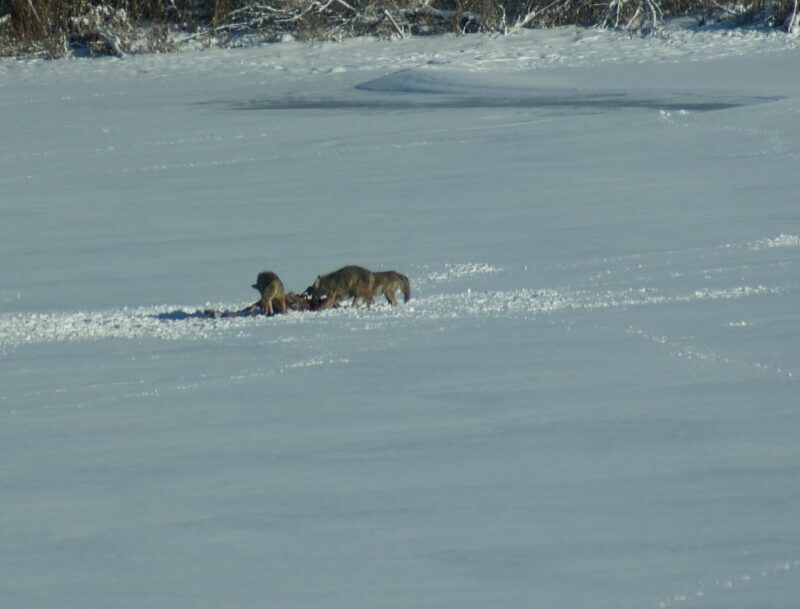 The coyote got hold of the deer’s jugular and in less than a minute the deer was still. That evening I had a moment’s pause where I thought ‘if only I’d run outside, the coyote would have run away and the deer would have been fine’, but based on watching how many animals feasted that day, I am happy not to have interfered with nature’s process. Within a few hours, most of the deer had been consumed, and now, 5 days later, all that remains are a few tiny pieces of rib. Pretty amazing to watch nature in action. Thoughts? Comments? Please share below.